Make rooms appear larger. When installing hardwood flooring, Portland homeowners often think lighter woods will help expand the space; in fact, the opposite is true. Darker colors create the perception of depth; thus, dark wood flooring makes it appear as though the walls are farther apart. Add sophistication and style. Whereas lighter wood creates a more rustic or country aesthetic, dark hardwood flooring possesses a richness that adds class and style to your home. It’s dramatic enough that you can tone down the rest of your décor, creating a more sophisticated atmosphere. Highlight bright décor. With dark hardwood flooring, Portland homeowners will find that light or bright colors really pop. Just remember, when it comes to bright colors, a little goes a long way – you want your décor and flooring to complement each other, not compete. Create interest and dimension. 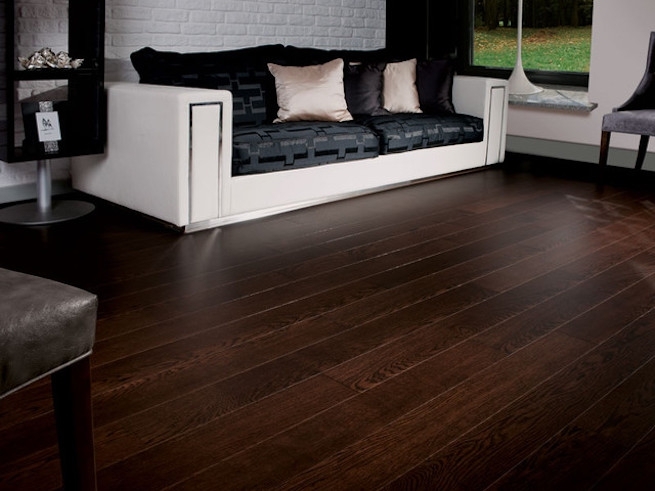 Dark wood floors give an appearance of texture and dimension that lighter woods can’t emulate. The light that shines on dark hardwood flooring makes the boards look uniquely different at different times of day. If you’re considering installing new wood flooring, dark hardwood floors are worth considering. Not only do they add richness and character to a home, but they can make small spaces feel larger.